After weeks of witnessing professional athletes misconstruing the details of high-profile police cases in Ferguson, Missouri, and New York City, a college team delivers some lucidity with a classy move in Michigan. The Rutgers football team showed their support for the New York Police Department (NYPD) on the heels of the cowardly slayings of two officers in Brooklyn on December 20. 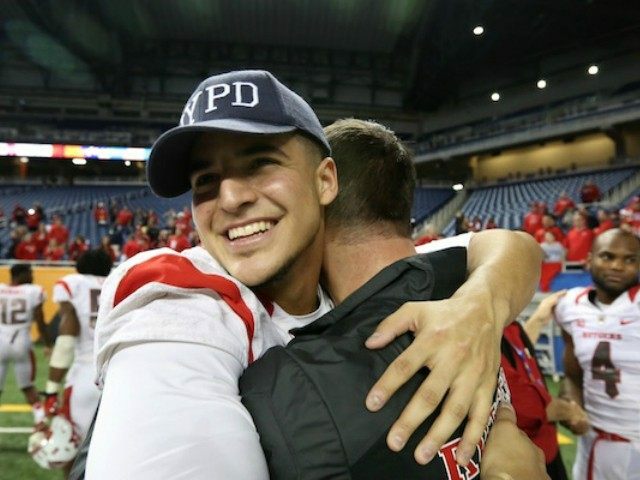 During their 41-20 romp over North Carolina in Friday’s Quick Lane Bowl, Scarlet Knights players and coaches wore NYPD hats on the sidelines. Rutgers head coach Kyle Flood has a brother that roots scarlet but bleeds blue. Jerry Flood Jr. serves as a sergeant for New York’s Emergency Services Unit. The nationally-televised bowl game provided a welcome sight for Flood and his fellow officers. Leagues reprimanded none of the players who wore the protest shirts or made the derogatory remarks. Imagine if a player wore a shirt that called for the end of abortion during pre-game warm-ups? Yet, blasting cops has been not only tolerated but given a free pass. Leave it to the college kids to teach the pros a little something. Rutgers gets an A+ in compassion, commonsense, and perspective. Not all of the pros are clueless lemmings. Last week, Jets center Nick Mangold wore an NYPD cap during his team’s coin toss and Tom Coughlin, head coach of the New York Giants, wore a black strip over his shoulder to pay tribute to Rafael Ramos and Wenjian Liu, the murdered officers. One might think more teams would similarly honor the police who protect them. A New Jersey university defeating a team from North Carolina in Detroit while honoring New York City cops works as a start. Kudos to Rutgers, big winners on Friday and their bowl victory had nothing to do with it. LeBron, Derrick, and company need to go back to the classroom and learn a thing or two.